PDF Merger Splitter is utility developed for merging various different pdf files into single file contain the information & data from all files in the sequence you have merged them. And Split a single file into various single or multiple page files, splitted on the bases of page number or page range. PDF merger splitter makes the files more organized & manageable and gives you efficient access to information needed from PDF files. ...... page numbers, and merge an boundless number of PDF documents into a single PDF file, our solution support you to do manipulation in all your PDF files. Combine the eBooks to make a single eBook for your convenience and Break a PDF file into several to make the file lighter in memory for easy to communicate or transfer. 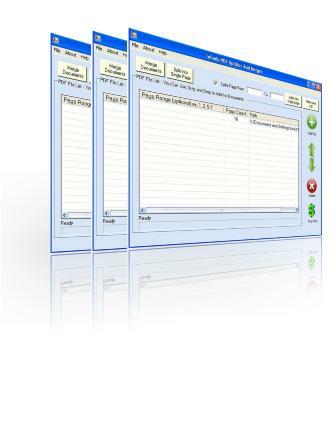 Split PDF file into single page forms for your use. The program is also very vigorous and consistent and supports virtually any flavor for PDF formats. Most PDF tool slowdown to a creep, when processing files with a huge number of pages; PDF Splitter Merger performs at a incredible speed to the last page. Even though abundantly featured, the program is very easy to use. From performance benchmark tests, we believe that the PDF merger splitter is a swift concatenate, append and split utility available today. Qweas is providing links to PDF Merger Splitter 5.0.1.5 as a courtesy, and makes no representations regarding PDF Merger Splitter or any other applications or any information related thereto. Any questions, complaints or claims regarding this application PDF Merger Splitter 5.0.1.5 must be directed to the appropriate software vendor. You may click the publisher link of PDF Merger Splitter on the top of this page to get more details about the vendor.